Hot on the heels of our analysis of Damian’s email which was concerned about end stage euphoria in the Australian housing bubble, comes this eyebrow raising testimony from an Irish professional living and working down under. “Eddie, got your Australian OUTLOOK. Thanks. I totally agree with your observation. I thought I’d write to you, give you some examples that I’ve noticed over the years, which to me give me the feeling that something is very, very wrong with the state of property here. My colleague at work is in his early fifties and an immigrant like myself. He has moved around quite a few countries like myself, and has bought and sold houses around the place. He’s been at lots of property courses over the past year and is finally taking the plunge and has bought an Australian property, with the intention to sub-divide, sell, build another and sell again. Even though he’s in his 50’s, he expected a mortgage of 15 years (even though he intends to sell up and take the capital gains to buy another, and another…). The bank gave him a 30 year mortgage! 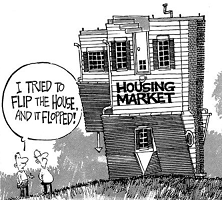 ‘Flipping houses’ is a common term here to buy, quickly renovate, and sell again. Some buy, renovate, and rent at the higher price, then go back to the bank to show them the increase in the equity as a result of the renovations and higher rent, which the banks almost always give to them! They then take this equity as a deposit to buy another house! Developers here will take a house and lot, worth say A$400k, and offer the owner double that to buy and to get them out quickly. Then they quickly demolish and build townhouses and sell them on. They obviously make less margin because they pay far above the market rate to buy the lot, but their game plan is to turn around a lot of properties with lesser profit, but greater quantities of them. I’ve a close friend in Sydney, married for a few years and both were shopping around for mortgages. They were even offered a mortgage but it wasn’t enough to buy anything – apart from 2 hour’s drive away! The bank even told them they should max out their credit card to use as part of the deposit!! Thankfully their parents talked sense into them. The whole thing reminds me of the movie ‘The Big Short’ where even the hookers are in on the game and buying up properties! I was at a conference in Melbourne, where a woman, similar in age to myself, had bought a house and a couple acres 1.5 hours north of Melbourne. They wanted an investment property. Melbourne is too expensive so they bought an apartment off the plans in Brisbane! They’ve never even seen it! Brisbane is considered affordable so those in Melbourne and Sydney are buying up there, raising prices on locals. 200,000 new properties lie vacant in the three major cities. Half of overseas investors (mostly Chinese) buy apartments, and deliberately don’t rent them, with the intention to sell in a year or two. By not renting keeps the demand for housing higher. They’re mostly in it for the capital appreciation on the property, not for the rent. Perth way out in Western Australia had around a 50% property correction in places after the mining boom. There are other small towns which saw exponential growth of properties, now they can’t sell them. The road sides coming into these towns were covered with flash V8 cars, jet skis etc. all with ‘for sale’ signs on them. The general rent to property price here is $1,000 rent a week = $1,000,000 purchase price, $500 rent a week = $500,000, etc. And we also have that nugget that is Negative Gearing, where the shortfall between rent made and mortgage rate can be offset against your tax! The only ‘saving grace’ I see is that, unlike Ireland, migrants are not likely to leave during a slowdown / recession. I don’t see the mass exodus out of the country like we saw in Ireland. It’s not like Europe where you’re an hour or two away from your original home. In Australia you’re so far away from everywhere else that if you’ve moved here you’re likely to stay. However, it’s been well publicised lately that if you pull out the net migration in, growth here is stagnant, and that the net positive migration is merely a ponzi scheme creating artificial growth by keeping demand on property ownership and rent. Historically Australia had net migration of 70,000 per annum, now it’s up to over 200,000 (and during the recessions elsewhere it was apparently hitting 350,000). So perhaps more people than I give credit for could up and leave if they had to. Australia also has a massive superannuation pension scheme which I’m sure they’d quickly change the law to tap into if push came to shove to pay their debts or to ‘stimulate’ the economy. A lot of Australian Pension money is invested in property and banks however…. Hope you like the insights. Negative gearing, a tax write off where there’s a rent shortfall versus mortgage costs is classic fiscal heroin for the game (we’ve had our own versions for designated areas) and extending debt to people into their 80’s while encouraging deposits using credit cards, all sounds familiar. That rents have flat lined in key parts and values have risen spells considerable danger. Yes, it is anecdotal but for heaven’s sake if you’ve family, friends or relatives in Australia do have a word in their ear – tell them to wait until everything is for sale, when there’s a rush for the exit doors before taking the plunge. Tell them to get in touch if they want to prepare a Plan B including how to avoid bank haircuts. It looks like they are going to need one. Next month exclusively available from www.jackandjill.ie Eddie Hobbs book, The Pivot, is available to pre-order and is about the excess debt in the global financial system and how to prepare Plan B.